I am on a quest to tidy my space. I love the sense of calm a well-ordered area gives me and yet I’m not neat by nature. I’ve been on the prowl to find tips to help me in my quest and yesterday I found a wonderful link on folding fabric. It inspired me to spend a couple hours refolding my fabrics and untangling my interfacing. And this project only cost me a trip to the fabric store to dig around their recycling bin for cardboard bolt cores. Let me know if you have any tidy tips to share with me – I desperately need them! Maybe I'll try and help you set up your new studio when it is ready! But really, I'll just want you to show me where BTK lived and go to Russo's. Oh how I love before and after pics! ps I checked your profile and all your favorite books are some of my faves, too! It looks so nice! 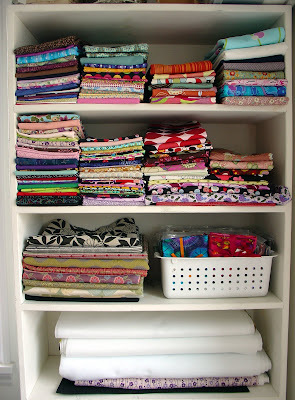 I keep telling myself that my cabinet will be clean when I use up all the fabric I have, lol. You've been tagged! Visit my blog for directions! Wow, nice job on organizing your fabric. I think you've inspired me to do the same with mine. Well done! I joined your etsy ring - first, I put in my shop url then realized I boo booed so redid it with my blog. Hi, I'm on the Willow Coop too, and came to see your fabrics. Grear job! I want mine to look like that now. Wait...I still need the cabinet or shelf to hold the fabrics...LOL! Oooh, those dividers sound perfect, Cinderelish! I'll have to look into them. HA about your shelves (or lack thereof) Cris. 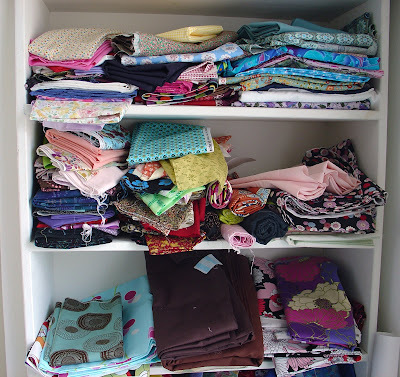 I think I might have been motivated to organize my selves to make room for all the co-op fabric I'm buying! Oh, I know! If you organized by major color, then not only would you have a neatly kept space, but you would also have an area that is colorfully pleasing to the eye! My tip was Cinderelish's, so I have nothing to add except great job!